Participants explored results from the model runs of the Community Water Model (CWATM) and the Hydro-Economic Model (ECHO) on mid to long term water resources management trends for East Africa. This workshop was the second workshop focusing on future water resources options and challenges in East Africa. It was held as part of the Water Futures and Solutions project, funded by the Austrian Development Agency. The workshop was hosted by the Government of Uganda in collaboration with IIASA and with the Lake Victoria Basin Commission in the newly established facilities of the Water Resources Institute of Uganda. The first workshop was held in Entebbe, Uganda in December 2017 and focused on understanding future development scenarios and their implications for water management practices in the Lake Victoria Basin. The purpose of this second workshop was to update participants on how the narratives and scenarios proposed at the first workshop had been utilized to drive the hydrological model CWATM and the hydro-economic model ECHO. The results of the model runs were presented for further discussion with all participants. The workshop brought together about 40 - 50 practitioners and policy makers engaged in government, academia, business, and civil society from Uganda and the other member countries of the Lake Victoria Basin Commission (Burundi, Kenya, Rwanda, Tanzania). The workshop also helped to capture key elements for policy messages emerging from outcomes and learnings of the project. To present and discuss the East Africa Future Water Scenarios to 2050 and the results of the related model runs. Joint learning with practitioners and researchers by introducing into methods and approaches of scenario development, hydrologic and hydro-economic modelling and analysis of data produced by these models. Drafting key elements for a joint policy brief on the outcomes and learnings of the research project. Participants and the IIASA team had further guidance from stakeholders and policy makers in East Africa to refine both, the water scenarios up to 2050 as well as the modelling work. The improvements will be reflected in the final working paper of the project. Practitioners and researchers have increased their knowledge base on the modelling frameworks applied, building mid- to long-term water resources scenarios and analysis of modelling results. Key messages gathered from participants help to draw on the outcomes and learnings from the research project, which will also be elaborated in the final working paper. In hands-on exercises, participants could increase their knowledge and technical capacity relating to working with the model outputs and results. The Government of Uganda in collaboration with IIASA, co-hosted a three-day stakeholder workshop in December 2017 in Entebbe, on the issue of projecting future water demand and water availability in the Lake Victoria basin. 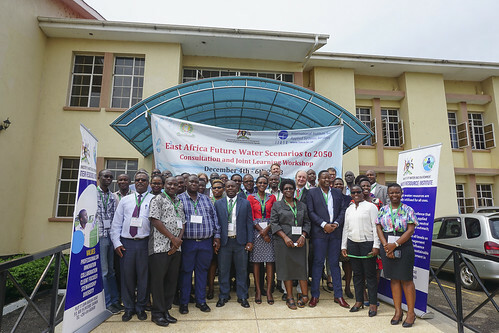 The workshop, attracted more than 50 practitioners engaged in government, academia, business, and civil society in the East African community, to discuss mid- to long-term water resource management options towards 2050. Applying systems thinking approaches, the workshop aimed at understanding future development scenarios and their implications for water management practices. The workshop started with sharing experiences on modelling initiatives in East Africa and efforts undertaken relevant for mid- to long-term water resources planning. One full day was dedicated to gaining a deeper understanding of development scenarios resulting from the East African community’s vision for 2050. Discussions focused on how water can support development aspirations as an enabler, and how water resources are likely to be adversely affected as a result thereof. The detailed workshop documentation can be accessed here.